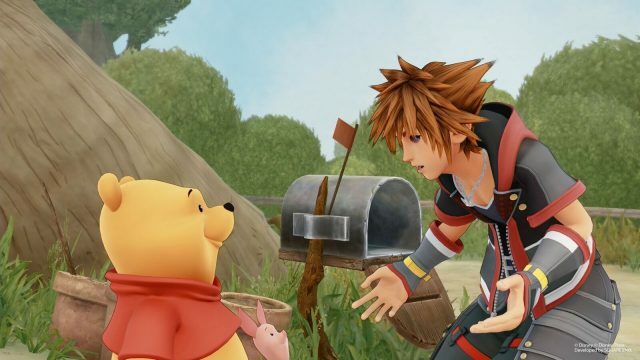 Chances are, if you’ve already followed the Kingdom Hearts series across eight games, six platforms, three console generations, and one extremely convoluted story, you’re going to be buying Kingdom Hearts 3 regardless of what I say. You don’t need me to tell you otherwise. But there’s that nagging thought that’s doubtless been festering away at the back of your mind for years now: Will Kingdom Hearts 3 live up to its lofty expectations? That’s another matter entirely – and one that isn’t definitively answered by a conclusive chapter that swings between being wildly entertaining one moment and being entrenched in baffling pacing decisions the next. Yes, Kingdom Hearts 3 is a lot of fun and a bit of a brilliant mess. I’m sure you wouldn’t have it any other way. So, this is it. Kingdom Hearts 3 is the final game in Sora’s ever-expanding journey through various Disney worlds in a bid to defeat Master Xehanort and Organization XIII. Not that you’d know it from the game’s opening 20 (yes, 20) hours. In what should have been a finale fraught with urgency, the first two-thirds of the game amounts of nothing more than (admittedly entertaining) wheel-spinning and soul-searching as Sora tries to unlock the Power of Waking. The problem is, each world Sora, Donald, and Goofy visit scarcely sees the objective brought up, instead offering up the feeblest of excuses to visit each world as a handful of minor villains paw at Sora like a cat instead of offering any real showdown. The reason for this, as you’ll soon find, and spoilers here I guess: it all’s leading up to the Keyblade War. I say spoilers, but, if you’ve played the previous entries, you know exactly what path it’s heading down. It just takes a long, long time to get there. Paradoxically, though, this makes Kingdom Hearts 3 the best game since the original to use as a jumping-on point for newcomers. 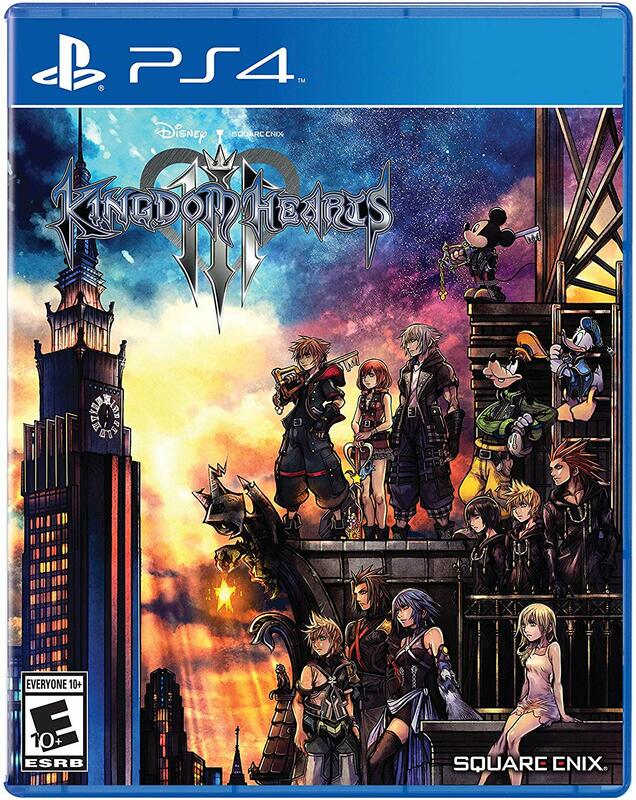 The series’ traditionally madcap story is relegated to cutscenes for the most part, with much of the core action and gameplay revolving around an abridged version of a Disney movie. Sure, you might not understand the references to the Replicas, Rikus, and several versions of the same character co-existing at the same time, but it’s fun fare all the same. Plus, for those who are worried that Kingdom Hearts 3 doesn’t offer an epic conclusion, the game offers that up in spades in a whirlwind final act that’s everything you hoped for and more. 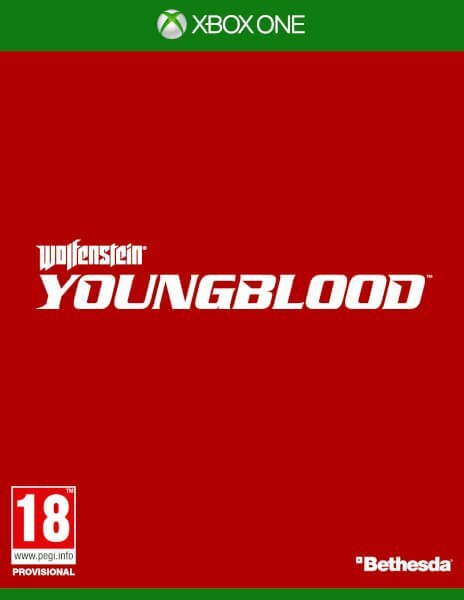 If you can stomach the majority of the game being place-setting for one helluva main course (and, I mean, you’ve probably waited over a decade for this anyway) then you’ll be able to gorge yourself on a flurry on fan-pleasing moments, as well as story beats and boss battles years in the making. It’s spine-tingling stuff and one that, eventually, arrives at a climax so effortlessly epic, and I don’t use that word lightly, that it makes the rest of the series seem like, well, a leisurely stroll through dozens of Disney worlds. As for the Kingdom Hearts 3 worlds, it’s clear from the very start that your mileage may vary. Weird choices are abound: Did we really need to go back to Olympus for the fifth or sixth time in the series? 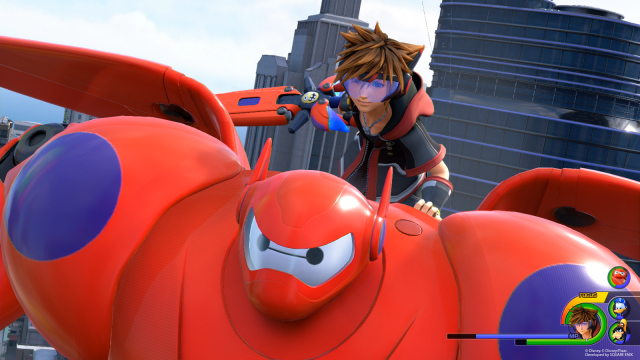 It’s especially jarring seeing as how Tetsuya Nomura and his team lean heavily on Pixar and more recent entries in the Disney canon this time around. Some middling Disney movies are picked — such as the likes of Tangled and Big Hero 6 — that may not carry with it some of the nostalgic cache built up by the likes of Aladdin and The Lion King. But it works. If you’re not familiar with the movies, you may just find yourself enjoying them that much more as the abridged plots twist and turn towards an ending. In fact, the choice to use more recent Disney movies for a canvas to paint Kingdom Hearts on is an inspired one. You could potentially be in a situation where you’ve grown up with Kingdom Hearts and now have children or young relatives that can watch their favorite Disney movies brought to life through its seven main worlds. You could even watch them play Kingdom Hearts the same way your parents did back in 2002. That’s amazing to me. It cannot be overstated enough just how much of a shared experience this game can be as new and old alike are introduced to a fresh generation of Disney. I’d crack a joke about the circle of life but I wouldn’t want to be so churlish, especially as the hairs on the back of your neck are probably standing up right about now. 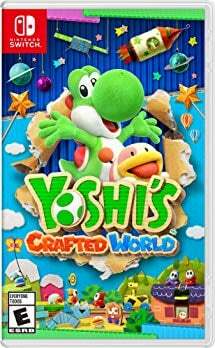 Admittedly, I was disappointed with the choice of worlds pre-release, having only made a real attachment with Toy Story, yet I’ve done a complete 180 after playing through each one. 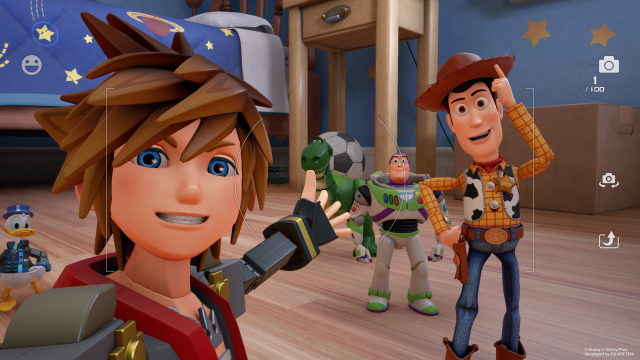 The Toy Box world may actually be the game’s only real disappointing level, with it feeling like a generic setting that haphazardly had Buzz and Woody slapped on it when Square were given the OK to use the license. Still, you get to listen to a “You’ve Got a Friend in Me” instrumental for a few hours. That’s probably worth paying $60 for alone. Kingdom Hearts 3 review | Keyblade bore? While the worlds and settings may feel new, those who have played Birth by Sleep and Dream Drop Distance will feel instantly familiar with the game’s combat. Kingdom Hearts 3 takes its cues from the former’s Command system, with Sora being able to hit combos with his Keyblade(s) (yes, you can swap between them on-the-fly now) to unlock various Commands and more powerful attacks as a fight wears on. It does, however, lack the kinetic flow of Dream Drop Distance thanks to its combo-breaking (and overpowered) special attacks. These fill the screen at an alarming rate; enemies explode into a cacophony of color and chaos, yet it’s all a bit brainless. The button-mashing style has never really waivered in Kingdom Hearts, though here it feels like more a case of “Press X to win,” furiously hitting the attack button until you’ve unlocked your next screen-clearing attack. This makes Kingdom Hearts 3 just a little too easy. 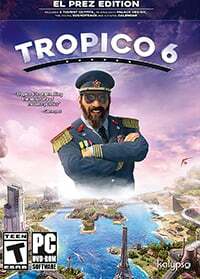 I didn’t die once during the game on Standard and only failed one objective—a pirate ship race of all things—during my 26-hour playthrough of the game’s main story. This isn’t a brag. My greatest gaming accomplishment is beating Cuphead and I’m definitely not on the level of someone beating Dark Souls 2 with a whisk or doing a no-ring run of Sonic The Hedgehog using only my shins. I’m not a great gamer, Kingdom Hearts 3 just makes it too easy to protect yourself from attack via its various accompanying Links (essentially Disney characters that can join the battle once your MP meter is full) and Commands. But combat isn’t the be-all and end-all. 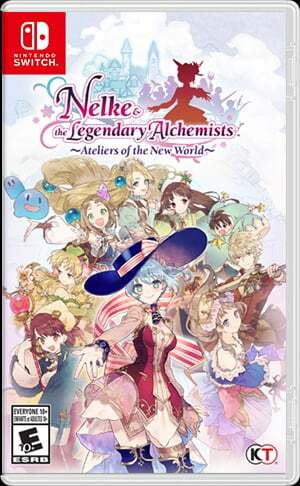 There’s enough side content here to keep you occupied both throughout the story and long after the game has quote-unquote “ended.” The endgame content should, perhaps, be kept under wraps (even though there isn’t much of it), yet the side-content here bounces from brilliant to banal. An Assassin’s Creed: Black Flag-inspired pirate ship minigame is, whisper it, maybe even better than Ubisoft’s original, while there’s a handful of other things to see, collect, and do in every world. The 90 Lucky Emblems, the well-hidden Mickey Mouse logos that litter the game, will keep you busy for weeks. Trust me. Oh, and the Gummi Ship is back. Yay? The semi-free roam aspect of it feels like a welcome return at first, yet you’ll still be irritated by its presence as a high-powered ship looms into sight and you have to take a massive detour just to reach your next world. Even so, there’s something for everyone. Yes, even those Gummi Ship lovers. But you’ll be able to ignore the faults. The pacing issues, the varying quality of side-content, and the lack of any real difficulty spikes will all melt away when you get to moments like Elsa singing “Let it Go,” or meeting Woody and Buzz for the first time. Or that boss battle. And that bit I definitely can’t talk about. The game is filled with moments you’re going to want to talk to family, friends, and random people on the internet about for months and years to come. It’s a truly shared experience. The game’s breakneck finale—when it eventually does get there—makes up for everything: It makes up for the series’ confusing plot; it makes up for the fact that it takes nearly a whole day’s worth of playtime to reach that moment; it makes up for the hokey stuff about believing in your friends and, golly gosh, light will save the day. 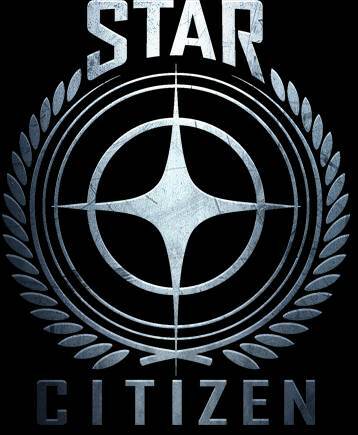 When the credits finish rolling, you’ll be safe in the knowledge that you’ve played a game like no other. Kingdom Hearts 3 was always going to beat to the sound of its own drum, that much is abundantly clear from the outset, but that nagging doubt can go away now: Kingdom Hearts 3 stuck the landing and serves as a truly outstanding end to Sora’s story. Buy Kingdom Hearts 3 now! GameRevolution receives a small commission when certain affiliate product links are clicked. 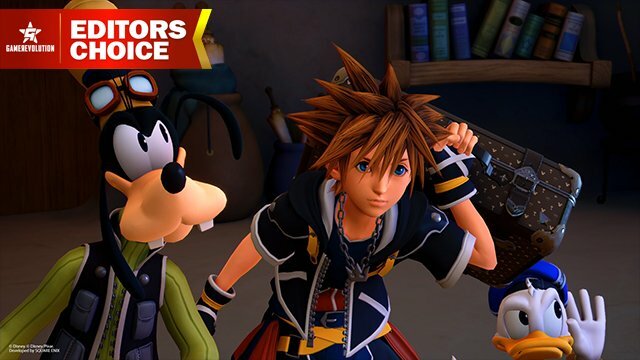 Kingdom Hearts 3 reviewed on PS4. Copy provided by publisher.